All four of our 2012 pups are successfully weaned, tagged, exploring, and mingling with other seals! In early July, RL10, the oldest of the four, was relocated from her birth site at Aliomanu Road to the more remote sands of Waipake Beach on the northeast shore. Conveniently, her new site was near the birth sites of the other three pups! The relocation was done for RL10’s safety; Aliomanu was a hazardous location for several reasons, the main ones being proximity to the road and high human use. Mahalo nui loa to our veterinarian for flying over from Oahu to assist with this effort; to our Kupuna for her prayers, chants and elbow grease; to our volunteers for helping to execute the relocation; to vacation renters and property managers for granting us access through their properties; and to assorted members of the public for their spontaneous help. It takes a village to move a seal! RL10’s mom, RK13, continues to be of concern. We are glad to report that she successfully molted at Mahaulepu Beach and has put on quite a few pounds since weaning RL10, but she is still thin. Now that the stressful process of molting is behind her, we’re hoping that she will start to gain more weight. 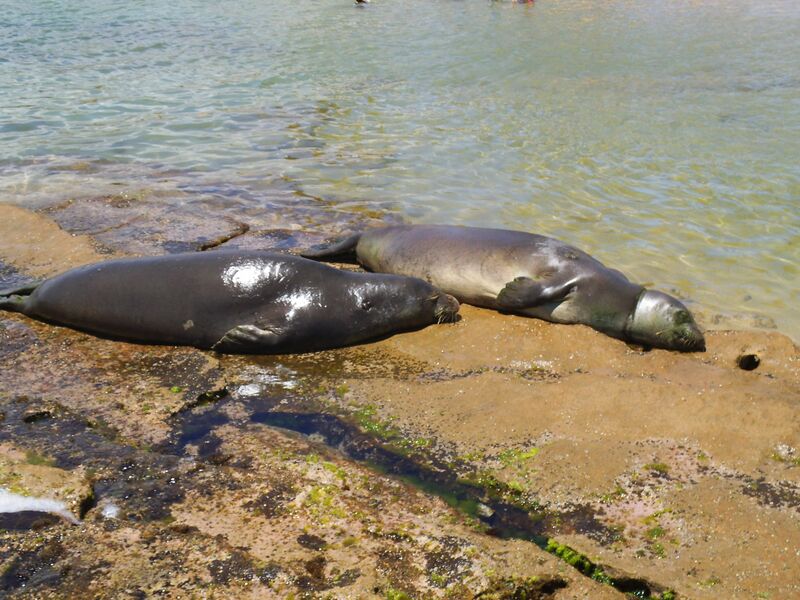 RL14’s mom, RK22, has been spotted several times on Kauai since weaning him. Her weight looks very good, she is 100% molted, and she was recently attended by adult male RK36 (of hook-swallowing fame, and still sporting his cell and satellite tracking tags) in the Anahola area. RH58’s female pup was weaned on June 26, after 38 days of nursing; and was flipper tagged L17/L16, making her permanent ID number RL17. RH58 (a.k.a. 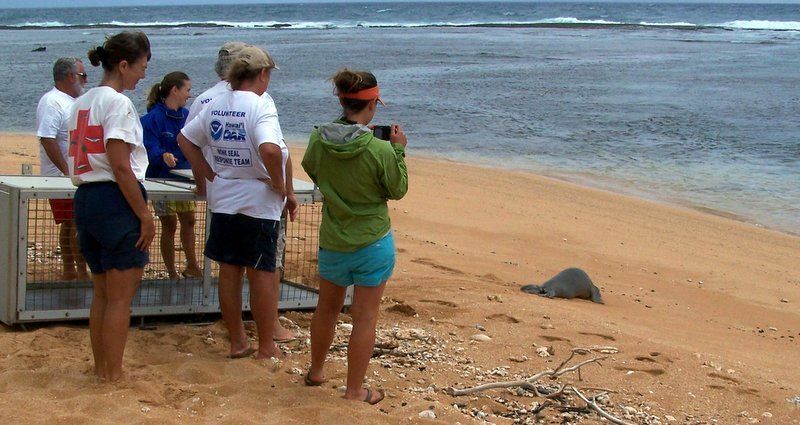 “Rocky”) has traveled back to Oahu, her usual stomping grounds. All four pups have still been observed in the Lepeuli/Waipake area, but the oldest three (RL10, RL14, and RL17) have occasionally left the area to explore new beaches to the north and south. Juvenile female RK52 (“Rocky”’s 2011 pup) has spent most of the past year on the north shore between Ke’e and Tunnels, but has returned to her birthplace (Waipake) for her first molt. As of this writing, she is about 30% molted. Juvenile male R6FQ began his molt several months ago, but has not completed it. Usually, monk seals only take about a week to lose their outer layer of fur and skin in their yearly “catastrophic” molt, but it’s not unheard of for a young animal to have a patchy molt like this. We are keeping a close eye on R6FQ (flipper tags 6FQ/6FO) to be sure his uneven molt is not a sign of a health concern. It’s with sorrow that we report both the appearance and disappearance of a new seal to our island. Yearling male Temp V17 was first seen this summer on the east shore of Kauai, and given the bleach number “V17” by our DLNR specialist on June 15. On July 30, Temp V17 was found dead in the Wailua area. Local fishermen reported the carcass and graciously led us through blessings and prayers for the seal on the beach before we removed the carcass. Necropsy did not reveal a clear cause of death, but no evidence of human interaction was observed.